Investment property - leased through 3-31-2019. 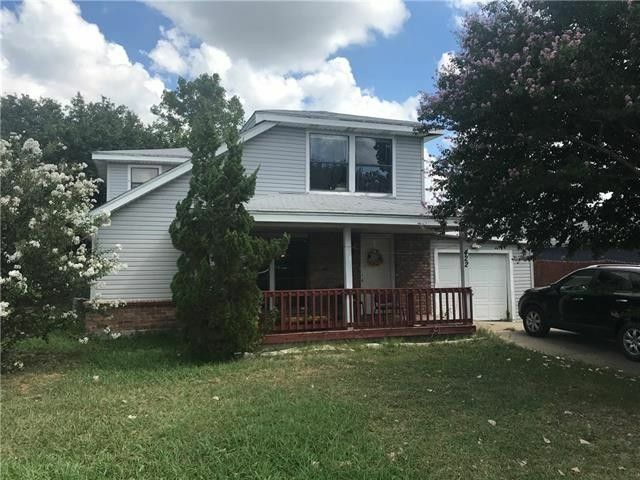 This awesome starter home has views of Rockwall Lake across the street and is just minutes from the Harbor District, shopping, restaurants, medical facilities, schools and I-30. The Family Room features a vaulted ceiling and is open to the Dining Room with built-in bookshelves. The eat-in Kitchen offers a stainless steel cooktop with vent hood, tile back splash and pantry. The downstairs bedroom has a large walk-in closet with laundry connections. There's also a convenient powder bath for your guests. Upstairs includes 3 generously sized bedrooms with ceiling fans and a full bath. The extra deep garage could fit 2 vehicles if parked tandem. Needs foundation work. Directions: I-30 to Rockwall, South on Ridge Rd for 0.4 miles, Left on Horizon for 1 mile, Left on Lakeside for 0.3 miles, Home on Left at end of street. Exclusions: Interior photos are not current, they are old and taken before it was leased. Needs Foundation Work.